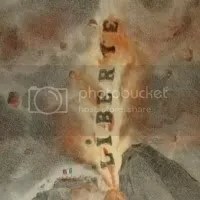 The volcano rears up, vomiting forth liberté in a fiery eruption cloud. On its flanks are representations of towns or settlements, each marked by the flag of a nation, with France the nearest to the crater. Lava pours forth, surrounding and threatening to overwhelm these fragile states. 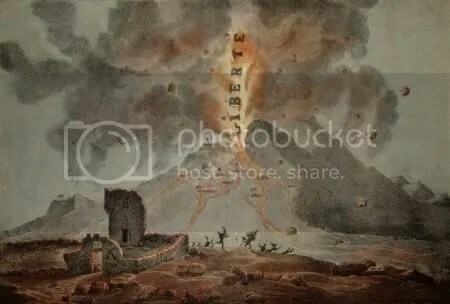 The sky is darkened with ash, and rocks hurled out by the eruption – each inscribed juillet, ‘July’, in reference to July 1830 – rain down upon the surrounding landscape. In the foreground stands a ruined castle, with the date ‘1789’ painted on its wall beneath a pair of crossed swords. This is the ruin of the old regime, destroyed in the French Revolution, the first eruption of the volcano of the liberty. Around it lie shattered stones from its fabric, thrown to the ground by the force of the eruption, each inscribed with an idea or concept overturned and destroyed by the revolutionary outbreak: féodalité, feudalism; dîmes, tithes; droit divin, the ‘divine right’ of kings; droit d’aînesse, the law of aristocratic primogeniture which was seen as strengthening the position of the hereditary nobility. Figures, whose clothing reveals them to be soldiers and aristocrats, are fleeing in terror from the eruption. The subterranean forces of popular revolution, seemingly safely contained beneath the earth, have broken out once more and are raining destruction upon the established order. 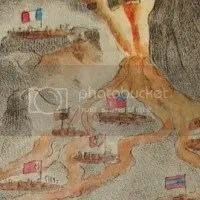 The rapid development of geological science and the beginnings of volcanology in the late eighteenth and early nineteenth centuries, paralleling the era of revolutionary transformation in both Europe and America, gave the association of the volcano with revolutionary political change added force and relevance. Just as volcanoes were now seen not as isolated phenomena but as expressions of the hidden forces that lay beneath the surface of the Earth itself, so revolution was increasingly seen as expressing the fundamental energies of political society. Desperret’s lithograph can be read as a warning to the forces of arrogance and complacency that such energies are always present, ready to burst out with unpredictable and transforming power.